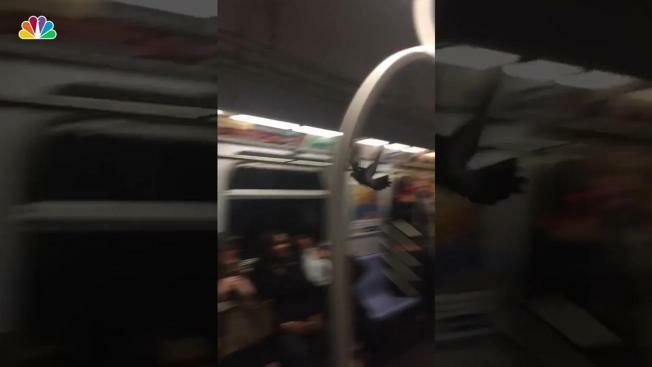 "Panic ensued as the pigeon flew back and forth in the car"
A rogue pigeon that decided to hitch a ride on a C train Wednesday sent passengers into a flap. The pigeon boarded the train at Franklin Avenue in Brooklyn, witness Sophia Patricia said. It then proceeded to fly up and down inside the train. "Panic ensued as the pigeon flew back and forth in the car until a frightened woman opened the car door and released the bird into the tunnel," Patricia said. The whole incident was caught on video. It shows the bird whizzing up and down the carriage as people either cower in fear or watch, amused. A quick-witted woman has perfect timing as she opens the door to release the scared bird. It's not the first time a non-human has boarded the train. Eagle-eyed social media users have been documenting the migration of the city's pigeons into the subway system as New York ices over, and last year saw a snake, a raccoon and a mouse all deciding locomotive transit was the way to go.